Beautiful brilliant golden sheen, which looks particularly intense in the sunlight. The perfect floating island to relax on. Even has a head rest and two cup holders. Inflated in just 2 minutes. After use stored in the smallest space. The star on the beach: Gigantic scallop with gold metallic look. A luxury version of a stylish summer accessory. For sunbathing and relaxing, at the beach and in the pool. 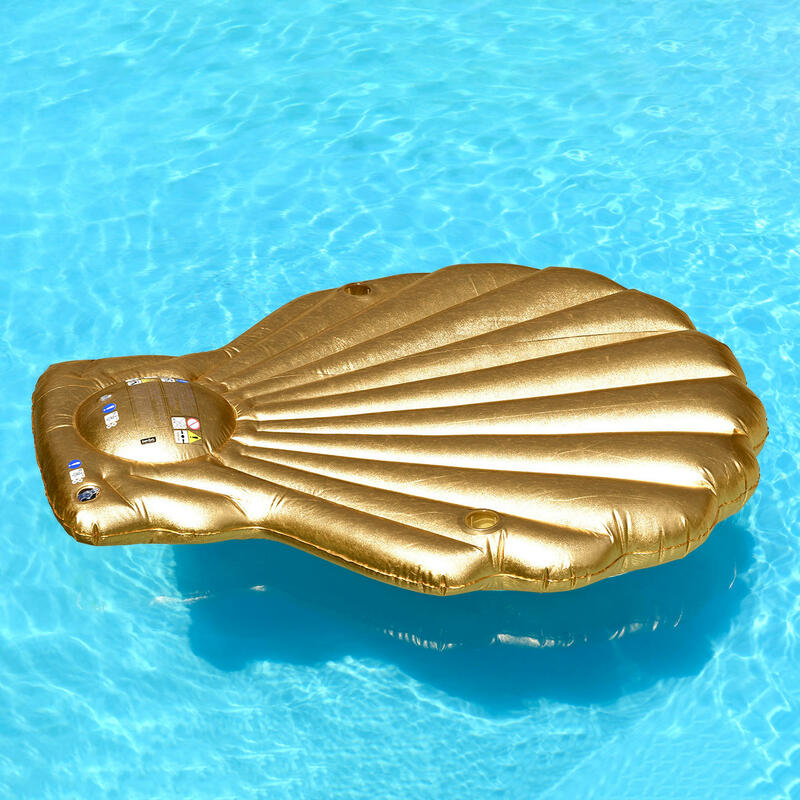 The must-have for this summer: The glamorous golden shell in XXL format. Not to be compared with the flashy floating animals which are commonplace. This cinematic floating shell is so much fun. It’s the highlight of every pool party and much admired at the beach. Material-dyed, the golden tone preserves its colour intensity – without fading quickly like cheap, printed foil. You can stretch out comfortably. The classic scallop shape with fan-like relief gets its natural, curved, expressively sculptural shape through a special manufacturing process. A common piston pump does the job in no time. The inflatable, saltwater-resistant PVC foil has a wall thickness of 0.29mm (according to NF 15649-1 standards). Outer edges and relief recesses are carefully welded. The 2 separate air chambers have safety valves. Inflated dimensions: 165 x 150 x 25cm (65" x 59" x 10") (L x W x H). Only 29mm thick without air – folds up small and easy to transport. Weight 2.2kg (4.9 lbs). Carries 1 adult (up to 90kg (198 lbs)). PLEASE NOTE: Use only in shallow water under adult supervision. Not suitable for children under 14 years.